I’m deeply committed to expanding the repertoire for cimbalom, and I’m publishing this informal how-to guide in hopes that composers will be inspired to write for the instrument. The pitch layout of the cimbalom is unlike any other instrument. All cimbaloms have the same pitch layout, and vary only slightly in size. Some older instruments are on a much smaller scale and have a smaller pitch range, but these instruments most likely will not be encountered because they are unfit for professional performance situations. The normal beating area of the string is between 1-2 inches away from the bridge. As one moves closer to or further from the bridge, sul ponticello and sul tasto effects are achieved. The standard cimbalom range extends from C2-A6. Unlike its close relative, the hammered dulcimer, the cimbalom is completely chromatic and has no repeated notes. G5, A5, and B5 appear on the diagram to be repeated, but these strings and these strings only have two accessible bridges, and thus two acceptable beating spots. C2 has one large wound string, C#2 and D2 have two wound strings, and the next 1.3 octaves (up to F#3) have three wound strings. From G3 to the top of the range, the strings are unwound and each pitch has four strings. Some modern instruments have a range of A1-A6, but these lower notes should be avoided because such instruments are exceedingly rare, especially in the United States. On the wound strings in the bass register, the beating areas are on the opposite sides of the instrument, with the C whole-tone scale on the right and the C# whole-tone scale on the left. This makes rapid passages in the bass register difficult to execute since the beating areas on each side of the instrument are 26-28 inches apart. Because of this, I try to keep each hand dedicated to one side of the instrument when playing in the bass register, if at all possible. The cimbalom has a single pedal used for dampening. Like the piano, the dampers do not affect the high notes of the cimbalom. All pitches from G5-A6 are undampened with the exception of G#5. This is only worth noting because the pedal will not completely cut off the sound of the instrument by itself. Hand dampening must be used to dampen the aforementioned pitches. The sympathetic resonance and sustain of the cimbalom is comparable to that of a piano. Cimbalom music is sometimes written on a single staff and sometimes on a grand staff. It really depends on the specific musical passage. Obviously if the music stays primarily in the treble range, there is no use for a bass clef and vice versa. This passage from Pierre Boulez’ Repons illustrates an effective use of grand staff cimbalom writing. Also notice the precise pedal notations. In this passage from later in the same piece, Boulez does away with the grand staff when it is no longer necessary. Because of the bizarre layout of pitches on a cimbalom, it is difficult for a composer to guess which hand will play which note. Because of this, range should be the only factor in determining which pitch goes on which staff. Stravinsky employed the technique of separating the right and left hand on different staves and as a result, his cimbalom parts are difficult to read. 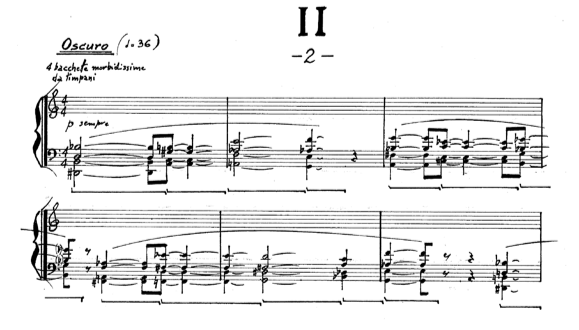 This example is from Stravinsky’s edition of Renard. This is the same passage of music from my personal edition of the part with corrected staff distribution. It is generally not possible to play with four mallets on cimbalom. Four mallet technique as we know it was developed on mallet keyboard instruments, which have a horizontal note layout. 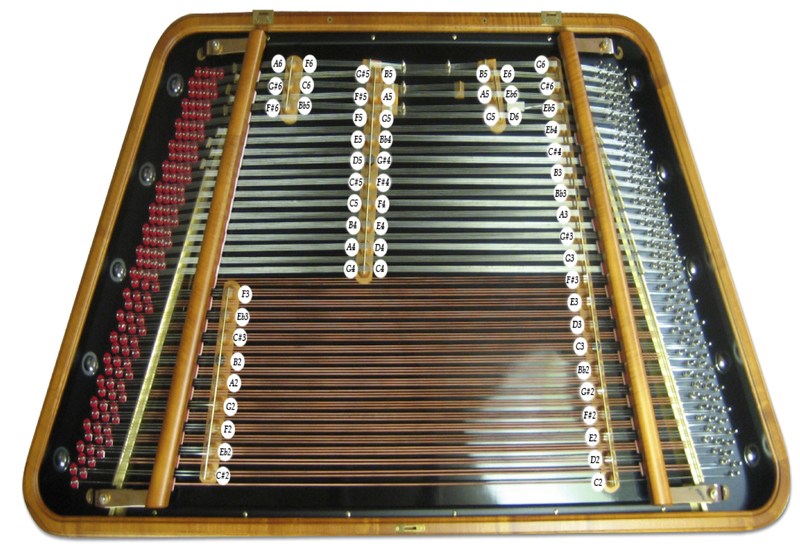 The cimbalom has a vertical layout. This renders the technique one might use on a marimba useless on cimbalom. That being said, some composers have found ways around this. In this passage from Renard, Stravinsky asks the cimbalom player to play two adjacent notes with one stick. The right hand alone would be used to play the Bb and G, since those strings are right next to each other. This type of writing is only seen in older cimbalom parts (see also Bartok’s First Rhapsody for Violin and Orchestra) because cimbaloms were smaller in the early 20th century and this technique was easier to achieve. Stravinsky also learned to play cimbalom to some degree and composed his cimbalom parts at the instrument, so he verified that this technique was possible himself. I personally don’t like seeing this technique in music. It is a bit like playing two adjacent marimba bars with one mallet: it happens by accident sometimes but it is very difficult to do consistently. The entire second movement of Alessandro Solbiati’s Quaderno d’immagini for solo cimbalom employs four soft timpani mallets. Notice however that the music is extremely slow, and that the performer has ample time to contort himself into the correct playing position. The standard cimbalom mallet is a small wooden shaft curving upward at the tip covered in either leather or cotton. 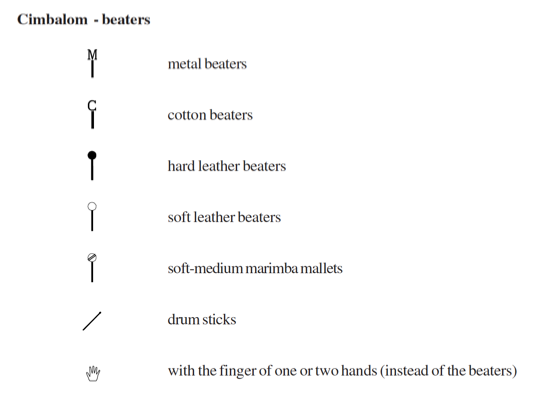 Leather mallets are more common in Western Europe while cotton mallets are more common in America. There is not an enormous difference between the sounds of the two, so when writing for standard mallets, only the hardness and not the material should be indicated. Composers have asked for various non-standard types of mallets over the years. György Kurtág often asks for fémver­­­ó, or metal covered mallets. In this passage from Scenes from a Novel, Kurtág pairs metal covered mallets with violin played col legno battuto. When writing for metal covered mallets, it is best to keep things below forte to avoid damaging the strings. In his cimbalom concerto, Gramigna, Stefano Gervasoni asks for a multitude of standard and non-standard mallets. Pizzicato is frequently used on cimbalom and is quite easy to execute even while holding mallets. It is also possible for one hand to pizz several pitches simultaneously assuming they are all within reach. Because of the note layout, there isn’t a standard intervallic reach, so check with a cimbalom player with your specific requests. Glissandi are also frequently used in cimbalom repertoire. Chromatic glissandi are extremely difficult to execute and should be avoided. Most commonly, composers ask performers to gliss on a particular set of adjacent strings, resulting in a pitch collection specific to the cimbalom. The following example from Ju Ri Seo’s Etude illustrates this concept. The glissandi in this passage use the notes on the left mid-treble range, and skip chromatic pitches that appear elsewhere on the instrument. Harmonics are also possible on cimbalom. It is best to keep harmonics on strings that are not divided by a bridge (C2-B3, C#4, and Eb4). Harmonics are possible, but less effective, on lower bridge-divided strings. Starting at F5, the first overtone is barely possible, and will sound more like a muted string than a discernible pitch. As with any stringed instrument, harmonics closer to the start of the harmonic series produce the strongest sound on cimbalom. On the wound strings, it is easy enough to produce the first five overtones. Anything beyond that would be a bit of a challenge. The high overtones also tend to get drowned out by the resonance from the rest of the instrument. On the unwound strings that are not divided by a bridge, the higher overtones sound weaker than on the wound strings, but are still possible. On the bridge divided strings, it is best to stick to the first two overtones. When notating harmonics on cimbalom, indicate which string the harmonic is played on, as well as the sounding pitch, as Gervasoni does in this example from Gramigna. Proceed with caution when considering an alternate tuning for cimbalom. Changing the tuning can be a very time consuming process, and on a program with other cimbalom pieces in standard tuning this could cause quite a problem. Making adjustments to only a couple pitches is easy enough though. Cimbalom strings are extremely taut in their natural state, so tuning upward more than a quartertone should be avoided. For general tuning maintenance purposes, I wouldn’t want to tune my strings downward more than a major 2nd. Also keep in mind that when tuning a pitch that shares a bridge with another pitch, both pitches will be affected. For example, tuning C4 down a quartertone will also tune G4 down a quartertone. This example, again from Ju Ri Seo’s Etude, represents an acceptable scordatura tuning, both in terms of execution and notation. When composing for extended techniques on the cimbalom, a general rule of thumb is that anything you might consider writing for the inside of a piano is easier to execute on cimbalom. Also, new extended techniques for cimbalom are being invented all the time. Essentially every extended technique in Solbaiti’s Quaderno d’immagini and Otto Canti are used for the first time in those pieces, so one can be imaginative. And, if you are writing for cimbalom and I’ve glossed over an area that needs further explanation, please let me know. This entry was posted in Cimbalom, composition, Contemporary Music, orchestration, Percussion on June 13, 2013 by tolleism. Thank you so much for all these precious informations about Cimbalom! I am actually writing a chamber music piece featuring this beautiful instrument and your text helped me a lot! Thank you again! This is great! I’m just about to start composing a piece involving a cimbalom, so this was incredibly helpful. You will also find a link to see the score also. I found your website just looking for ANY composers/performers interested in new music for such a dynamic and capable instrument. I appreciate any thoughts or good word you can spread. Who, besides yourself might be good to contact regarding possible new music performances for cimbalom? Good to see someone promoting new music. really useful information and I enjoyed the Etudes: great playing and recording. Thanks!